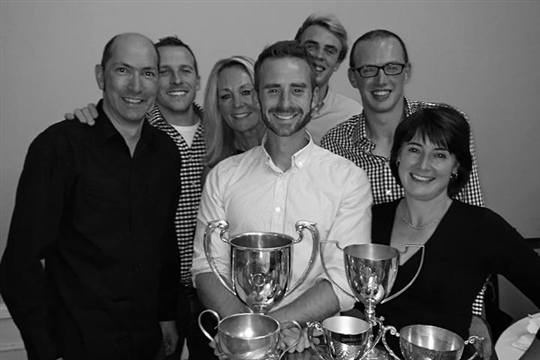 Photo right: Team members at the 2016 end of season presentation evening with our silverware collected that year (right to left: Tony Ambridge, Rhys Schell, Sally Hawkins, Will Baillie, Francis Smith, Sim Holmes, Sarah Fleming). Devizes Tennis Club offers competitive league tennis for a range of abilities. We play in the Chippenham & District Tennis League in the Summer months against local clubs. We also enter teams in the Winter Mixed leagues of Chippenham and Swindon. For the latest tables and fixtures for the Chippenham league please check the website linked above. We are always looking for league players and if you would like to play league tennis please contact Sim on email: devizestennischair@gmail.com. Please note, to represent Devizes Tennis Club in league matches MUST be a member of the club.